It’s Jacqui Gedman’s first year being our Acting Returning Officer, making sure that we have fair elections in Kirklees. 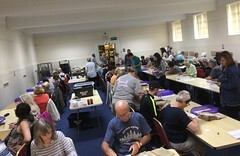 It’s a week before the 2016 local elections and the huge task of opening the postal votes from the Kirklees area is already well under way. 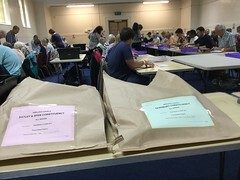 Over 51,000 postal votes have been issued for the local elections and PCC elections on Thursday 5th May 2016. We talked to Chris at the postal vote opening to find out where your postal vote goes after you pop it in the post box. Karen Allison, new councillor for the Newsome Ward, tells us that she’s “shattered, proud and pleased”.